Welcome to another installment of the Marine Depot Question and Answer Video Series. Now this is a great question because building and keeping your first reef tank can be quite intimidating but Lucky for you guys MD is here to help you through it. One thing all reef hobbyists have in common is at one point or another we have all been “newbies”. Some of us have come in to the hobby with previous background in freshwater aquariums or some other aquatic hobby while others come into the hobby with no experience at all. So where does one start if they have never been in the hobby and are thinking about taking the dive in to reef keeping? We typically recommend an aquarium 20 gallons or larger for beginners. Water parameters are more stable in larger aquariums and gives you more room for error. 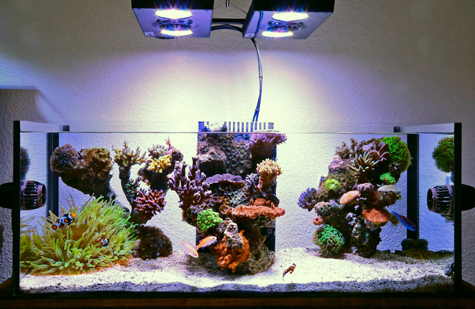 Saltwater fish and corals are more sensitive to changing water conditions, so a larger aquarium significantly improves your chance of success in the hobby. 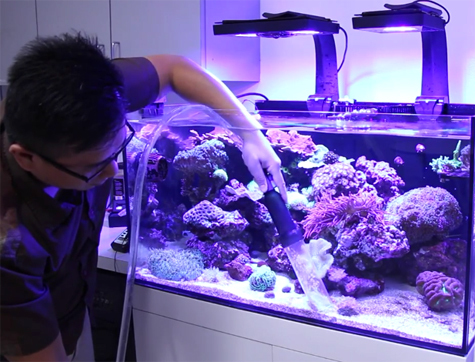 Smaller aquariums such as Nano and Pico Reef aquariums can be extremely challenging. Measure the space you have available to see what is aesthetically pleasing to you then try and fit the largest aquarium possible in that space. You can even mock up a replica of your future tank out of cardboard; think about the height and how the tank will best be viewed. How much are you looking to spend up front and how much can you afford for monthly maintenance? Smaller tanks don’t always equate to smaller budgets in terms of set-up and equipment. As an example, water testing for a 10 gallon aquarium costs the same as water testing for a 100 gallon aquarium, however, the cost of stocking and maintenance will be considerably less when keeping a smaller aquarium. A typical cost estimate for a reef tank is about $50-$100 per gallon, excluding livestock. The main thing to remember when purchasing your tank and equipment is you are far better off purchasing quality equipment up front. The cost of replacing faulty equipment or upgrading ineffective equipment can really add up over time and not to mention also put your animals at risk. This when the real fun begins. Research is one of the greatest tools for new hobbyists and is a fun part of the process. Here at Marine Depot we have created a database of videos, charts and diagrams, articles and so much more that you can find on our website completely free of charge. Personally, my favorite aspect of reefkeeping is that I am always learning. With over 15 years’ experience in keeping aquariums I still learn something new every day. Educate yourself as much as possible before purchasing any products or livestock. This will save you both money and senseless frustration. One of the most common mistakes I see new hobbyists make is an impulse purchase of livestock. Not all fish and aquarium animals are meant to be kept together and many of them have very special requirements. When keeping a reef tank, it is all that more important because corals and invertebrates are highly sensitive to water quality and having a mature aquarium with stable water parameters is crucial to your success. You will want to check out product reviews to see what others have experienced and join an online forum or local reef club to get in touch with other hobbyists for support. Every aquarium is different and finding out what works for you is the best way to choose a particular product or piece of equipment that you will be happy with. 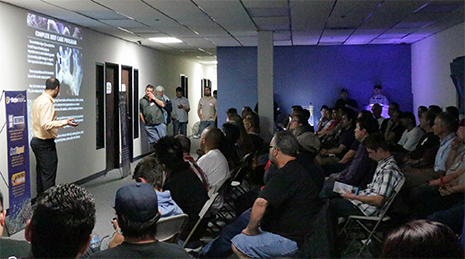 In in the end, you need to figure out the goals you want to achieve with your aquarium. Is there a certain type of fish you really want in your tank? If yes, make sure you set up the proper environment for the particular fish in regards to tanks size and aqua-scaping. Is there a certain coral or invertebrate you must have in your tank? Well you will need to ensure you have the proper lighting, water parameters and flow needed to keep the particular coral alive and thriving. The more you learn before diving into building a reef tank the better prepared you will be to overcome obstacles and provide the right environment for a healthy happy aquarium. If you’re looking to build your first reef tank, this simple three step plan of action will surely help make your experience more successful. MD is happy to help you along the way and we have a fully trained team of aquarium experts that are eager to provide you with quality support. Don’t forget to like, share and subscribe to show your support and help out other new hobbyists and until next time, take care and happy reefkeeping.